Joker Sports is now the best live sports streaming add-on for Kodi. A throne once held by SportsDevil, Joker Sports has become the new go-to source for live sports streams like UFC, Boxing, NFL, MLB, NBA, World Cup and much more. Major crackdowns by law enforcement in the world of all-things-Kodi have led to most of the known add-ons to shut-down. TVaddons, Fusion, SuperRepo, AresWizard and of course SportsDevil are just some of the latest victims. Fortunately, Kodi developers are resilient and have adapted the way they distribute video add-ons. Rather than create centralized repositories that store large amounts of video add-ons, developers are now distributing their add-ons through GitHub. As a result of decentralizing, it’s much more difficult for authorities to confiscate or shut down servers containing third-party add-ons. 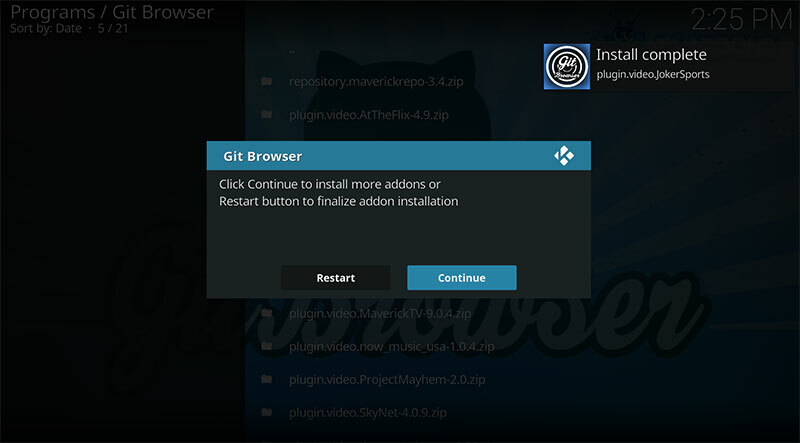 Before you can get started installing Joker Sports, head over to our article for installing Git Hub Browser to Kodi. 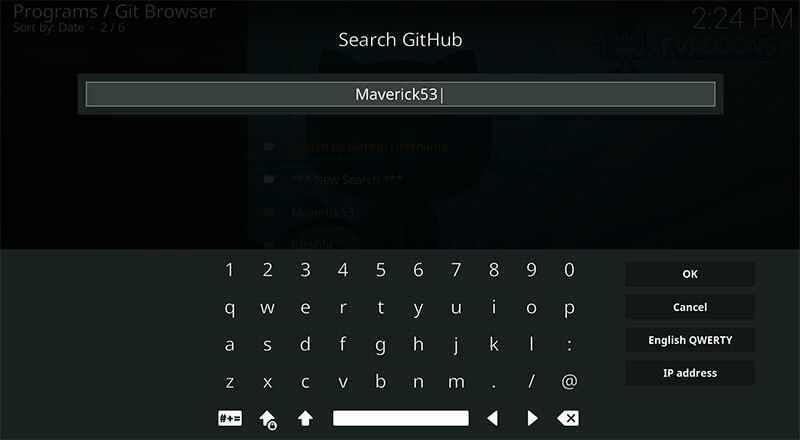 Open Git Browser, assuming you have already installed it to Kodi. If you haven’t, follow our detailed guide to quickly install Git Browser. 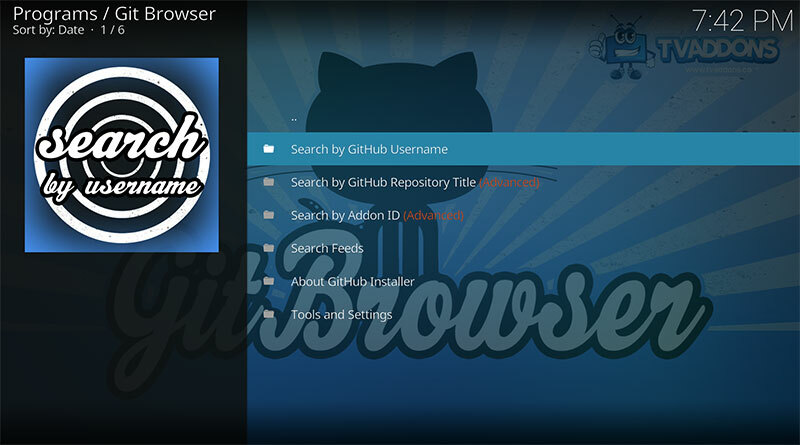 When Git Browser opens, select Search by GitHub Username. Joker Sports is developed by Maverick53, so enter that name in the search field and select OK. Your search will result in a list as shown below. Scroll down and select plugin.video.JokerSports-1.x.zip. Now, select Install to begin installation. Once Joker Sports is installed, select Restart. Go to your video add-ons and open Joker Sports. You’ll see a list of sports channels and events to choose from. There is a good chance that something you are streaming on Kodi is copyrighted. Copyright infringement is widely enforced and it starts with your ISP. Don’t let your internet provider, or anyone else, see what you’re doing online. Instead, we highly recommend getting a VPN to keep yourself anonymous. VPN’s hide your identity and use a different IP address on virtual servers throughout the world. Check out IPVanish for their great features and special offers on VPN’s. Make sure you have you the latest version of Kodi installed. If you’re using this on an Amazon device, you can go to your Settings > Manage Installed Applications > Kodi > Clear Cache. After you clear cache, Force Stop from the same menu and then Launch Application and see if that works.